Via my clear connection to the realms of spirit guides and angels, I provide in-depth written readings containing spirit wisdom, guidance, and illumination to support you along your earthly path. There are always ‘spirit beings’ waiting for the chance to communicate with you. This may be one of my spirit guides, or your own, perhaps one with you for the whole of your life, or perhaps with you temporarily to help you achieve a particular aim or develop a particular talent. It may also be time to connect with your guardian angel, who you can think of as the custodian of your life, providing the protective matrix for your ‘being’ in this world. 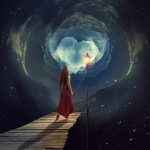 Yet it may also be time to open up a connection with your own Higher Self, the part of you that knows what it is you are here to do in this life and is the ’emissary’ for your soul. Whatever the source, you will be given information and possibly instruction to help you understand so much more about yourself, and to direct you towards finding ‘wholeness’ and fulfillment. The overall aim is to help you expand into a new awareness of who you are; to integrate and heal what has been hidden or lacking in your life. This is often brought alive by the use of symbolic imagery, illustrating what is happening or about to happen in your life, and occasionally I am taken on a spirit journey to realms that are profoundly important for you to learn about. In several detailed pages you will be provided with exactly what you need to know for the immediate journey ahead, and to help you move forward on your mission as a soul here on earth. To do a reading, I will chat to you via email or phone, to find out if there is anything particular you would like to focus on, and then I work remotely, linking intuitively at a deep level, writing down everything I am shown and told. I ‘make contact’ with you initially from your astrological chart, which acts as a springboard for a profound connection with you – so I will need your birth details from you before proceeding. Often the spirit guides coming through will refer to the key aspects of your birth chart, and the changes currently occurring. There are two possible options for readings. One is a long reading, up to 4/5 pages A4. The other is a thee-quarters reading with accompanying essence mix, as detailed in Personal Transformation. This combination gives you both words of illumination, and healing, transforming, energising and clarifying energies to shift and open you internally to new ideas and new horizons. Please contact me if would like to find out more. Go to Testimonials for some client feedback.